At the weekend Garden Dad and Garden Girl harvested 32 garlics. It was very satisfying to see them resting on top of the soil, although we had to move them indoors at the end of the day for fear of it raining. Last year we didn't grow any at all because the catalogue we ordered them from had run out and we never got around to going out and buying some. But if this year's crop taste as good as they have grown we'll definitely be growing garlic again. We also cleared away all the dead broad beans. It was starting to become quite disheartening seeing them there, all black and shrivelled. 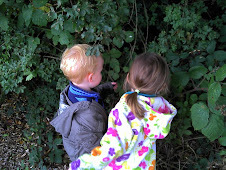 We were very pleased to hear however that the little orange bugs that had appeared all over them are ladybird larvae. This is great news as it means the black fly will soon be gobbled up and we will hopefully not lose any other crops to these little terrors. It is also good for this weeks theme which happens to be ladybirds. It should make for an interesting ladybird and larvae count tomorrow. We also visited Grandad and Grandma South at the weekend to reclaim our camera and take a nosey look at their vegetable patch. With a hint of jealousy I must admit that their crops are looking particularly healthy and flourishing. Made all the more galling by the fact that some of these crops were started off by ourselves. I am consoling myself with the knowledge that our efforts earlier in the year have bourne fruit, if not in our garden.